Books always make good gifts, they're pretty easy to buy especially if your buying for someone you don't know too well. Like for a work secret Santa or even as stocking fillers. You can buy them really cheap from Amazon or even find brand new copies in charity shops. I'm a big reader so I love getting books as presents, I always get my dad some for Christmas too. Charlaine Harris - Sookie series - I have all of them apart from the latest, this was actually a Christmas present last year. They're completely different from the TV programme so are a must if you're a fan of True Blood. Kate Brian - Private series - This series is based on a group of teenagers at a boarding school in America. 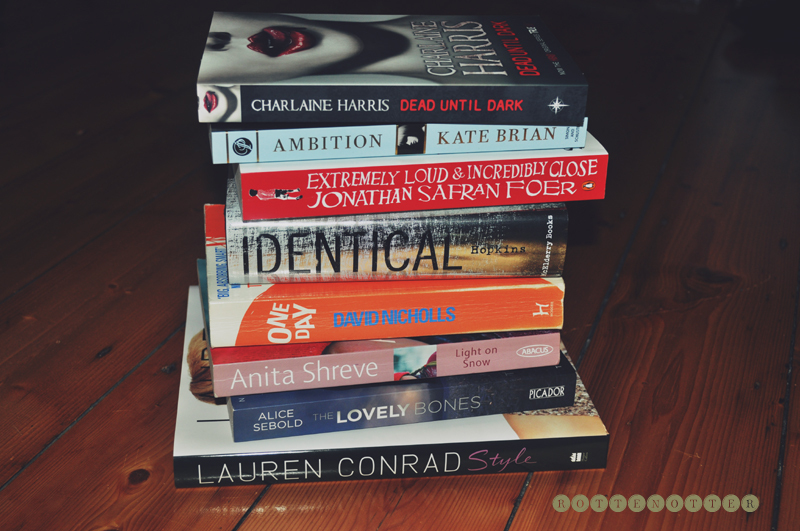 Despite being classed as "young adult" I still really enjoy them, they're good holiday reads. Still need to read the last few of these actually. Jonathon Safron Foer - Extremely Loud & Incredibly Close - This is one of those books that if you read twice you'll discover things you didn't even realise the first time you read it. It's about a 9 year old boy, Oskar, who is trying to discover the mystery of a key he finds after his dad is killed in 911. It's a wonderful but sad read which is being turned into a film. Ellen Hopkins - Identical - I love books that are in unusual formats which this one is. Each page is like a poem so they're really short but still gives so much detail. It's about two twins, everything on the surface seems fine but they're keeping deep damaging secrets. It's a really powerful book and wonderfully written. David Nicholls - One Day - It seems like everyone's read this one.It's about Emma and Dexter and what happens in their lives on the same day each year. Cried like a baby at the end, totally unexpected. Anita Shreve - Light On Snow - The story is told by 30-year-old Nicky of the events that happened when she was 11. Her and her dad found a baby in the snow and what follows on from that. Alice Sebold - The Lovely Bones - Another popular book, about Susie Salmon who is murdered and how her family discover who did it. The film is really good too, something that doesn't happen that often when books are turned into films. Lauren Conrad - Style - I have a more detail post on this book here with photos of some of the pages. If you're a fan of Lauren then you'll love this book.